There’s an invasion going on in the Marvel Universe. Alien shape changers have infiltrated our super teams and taken over the persona of some of the most mighty heroes. Their intent: to take over our planet, which they see as rightfully theirs. I’m really looking forward to this spring and summer’s Mega Event. It just feels exciting. According to interviews from Marvel Mastermind Brian Michael Bendis, this storyline has been brewing for years. According to him, after this story is done we’ll be able to look at recent events such as Avengers Disassembled, House of M, Secret War, Civil War, and Captain America’s Death, and be able to see a Skrully hand manipulating all of it. This doesn’t feel like a simple retcon to me…this apparently has been sneaky ol’ Bendis’ plan from the very start. And I think that’s why I’m enjoying it so much. It’s creative, it’s well planned, and it feels like there are real consequences. Who knows who could be a Skrull? We’ve already seen Elektra and Blackbolt revealed as Skrulls…could we see Spider Man as one? Thor? Devil Dinosaur and Moon Boy? Since they did the unthinkable and killed Captain America – and kept him dead for a year now – you have to wonder if Marvel is willing to take chances on some of their other major characters. When Marvel announced Civil War a couple of years ago, they said the intent was to bring a level of distrust back to our heroes. It used to be that when Spider-man crossed paths with the FF, there would be some doubt about the other hero’s motives. The FF saw all the negative reporting in the newspaper about Spidey and wondered if he could be a criminal, and Spidey distrusted anyone that might be inclined to try to have him arrested. 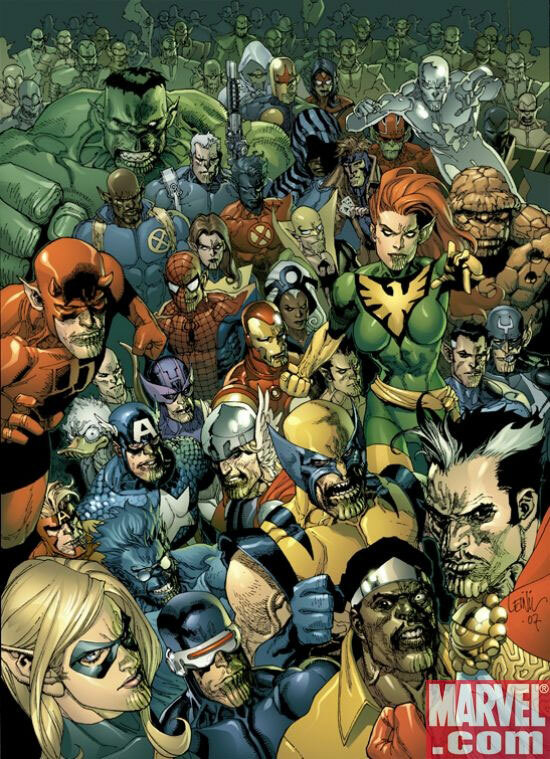 The Skrull storyline succeeds where Civil War fails. Civil War seemed like a good idea with a lot of potential that ended up rushed, written by committee, and edited to pieces. On the other hand, Secret Invasion seems well crafted, paced correctly, and genuine. The threat seems real, the implications seem dire, and the distrust between the heroes seems at an all time high. Not only does each character have to wonder if their teammates are aliens, but they also have to wonder who has known what, and for how long. It’s a fun story line and I fully hope that Marvel is finally able to fulfill the potential of the story. Most importantly, this is a story that deserves to be an event. 1. Cyclops. The leader of the X-Men has gone all hard assed of late. Apparently the mutant decimation and loss of Professor X has gotten to him. Or maybe a Skrull has. 2a. Ms. Marvel. You can bet that the Skrulls have landed in SHIELD. Who better than a SHIELD agent who also leads the Avengers, and can keep close tabs on Tony Stark? If not her, look for…. 2b. Maria Hill. Stark’s #2 at SHIELD led the organization from Secret War to Civil War, and her arrival coincided with with Nick Fury’s disappearance. Speaking of which…he’s due for a return. What role will he have in Secret Invasion? 3. Wolverine, but only the New Avengers Wolvie. The X-Men’s is the real one. It would go a long way to explaining how he can be in every comic at the same time! 4. The Scarlet Witch. A Skrull with Wanda’s powers could have intentionally caused House of M (a perfect opportunity for Skrulls to move in?). Plus doing so allows Marvel to bring her back, all heroic-like and not at all crazy. 5. Hawkeye. Hey, weren’t you dead? Oh yeah, that’s because you’re a Skrull. What do you think? Who’s a Skrull? Who do YOU trust? This entry was posted by Michael	on Monday, March 10th, 2008 at 3:46 pm and is filed under Marvel. You can follow any responses to this entry through the RSS 2.0 feed. You can leave a response, or trackback from your own site. It definitely is a risky move, sure to upset any of the fans of the characters outed as skrulls. Wasn’t there huge back lash when it was suggested that Peter Parker might have been a clone? When I saw the press release for this arc, I just dimissed it as a gimmick, but your take on makes it sound more interesting. I guess I’m just burned out on the giant crisis cross over events. I have been sitting them out since Infinite crisis. Maybe there six or seven Wolverine skrulls running around, one for each writer who must have him in their book.